Now available in a 24-session half-size program for experienced traders for $4,995! Foundation Meetings: In 16 one-hour Foundation Meetings over the Internet using Webex, I teach the trader how to think, trade and handle his capital like a professional trader. First, I make an assessment of a trader’s experience and his challenges. Next, we go through a syllabus of presentations designed to teach the trader exactly what he needs to do to become a successful professional trader. Together, the trader and I develop a detailed written trading plan that clearly identifies set-ups, sizing, risk and loss limits, as well as strategies to exploit winning trades and maximize winning days. The Foundation Meetings are recorded and the trader can confidentially review the meetings and the concepts presented as many times as he likes, whenever he wants. Four-day-a-week meetings for two weeks:After our 16 one-hour Foundation Meetings, we will speak for one hour each day, Monday through Thursday, for the next two weeks. During each day’s meeting, we will go over a chart marked with the trades the trader took, establish strategies for improvement, and make an outline for the next day. Our goal during these two intensive weeks is for the trader to become competent and confident in executing our mutually-developed Trading Plan. In many of these sessions, we will trade together during the live market session with you placing the trades and me coaching you live, one-on-one. Twice weekly meetings for 8 weeks:After the four week, four-day-a-week one hour sessions, we will have established our plan and set our goals. For the next 8 weeks, the trader and I will meet twice a week to move his trading forward: hone his understanding of the market; establish and monitor his discipline; and oversee his implementation of the Trading Plan. Once a week meetings for 8 weeks:In this final phase of the Mentoring Program, the trader and I will work on the finer points of trade management – exploiting a runner and, importantly, adding to a winner. Lastly, we will make plans for the trader’s long term growth. After the completion of the program, outlined above, I remain available for ongoing coaching and consultation on an hourly basis. My background I have spent my entire adult life in the futures trading business. Coaching professional traders is the exciting and rewarding culmination of my career in futures trading. 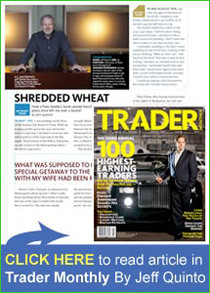 I do not know of anyone with my extensive, long-term successful background in futures trading who coaches traders. Nor do I know anyone who has my track record of success with futures traders. Cost of the program The Professional Trader Mentoring Program can be purchased as the full 48 session program or as a 24 session 1/2 size program for experienced traders. The cost of the full 48-session Professional Trader Mentoring Program is $9,700, if paid in advance. If more convenient, payment may be spread over three monthly installments of $3,497. The 24 session 1/2 size program is available as a stand-alone program of 24 one-hour sessions for one payment of $4,995. After the initial 48 sessions, I am available as a mentor on an hourly basis with the trader buying blocks of 5 hours for $1,500. Mentoring charges are payable in advance and may be paid by check, bank wire or by Visa, MasterCard or Discover through PayPal, below. Click on the PayPal button below to purchase the 24-Session Half-Sized Professional Trader Mentoring Program for one payment of $4,995. Click on the PayPal button below to subscribe to three payments of $3,497 to purchase the 48-Session Full-Sized Professional Trader Mentoring Program. In summary I help traders to be their best by implementing rational trading strategies within a risk framework that attempts to quantify and limit losses and exploit opportunities. I love coaching traders and I am pleased to have dozens of traders from around the world who started as Professional Trader Mentoring Traders and have become competent, confident professional traders, and my friends. E-mail me or call me at +1-312-685-5333. Electronic Futures Trader Jeff@JeffQuinto.com +1-312-685-5333 Derivative transactions, including futures, are complex and carry a high degree of risk. They are intended for sophisticated investors and are not suitable for everyone.